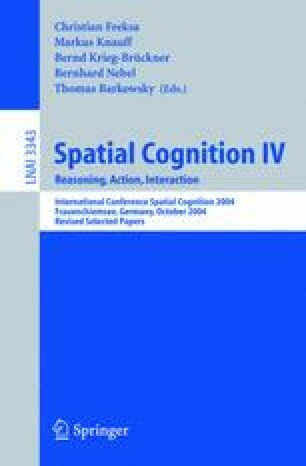 In contrast to most research on spatial reference, the scenario in our human-robot experiments focuses on identifying rather than localising objects using spatial language. The relevant question in such a task is “Which” rather than “Where”. In order to gain insights about the kind of language to expect in such a scenario, we collected participants’ linguistic choices in a web-based empirical study. Spatial scenarios were presented that varied with respect to number, shape, and location of elements, and with respect to possible perspectives. The linguistic analysis reveals that speakers adhere to underlying principles similar to those known for non-spatial object reference. If objects only differ in spatial position, a reference system and spatial axis is chosen that is suitable for contrasting the target object from competing ones. The exact spatial location is usually not specified if there are no competing objects closeby.